In tech terms, VoteMatrix is an open information platform built around universal principles to track and provide personalized analytics on political actions, candidates, and measures and provide election day ballot recommendations with drill-down personalized approval ratings. The VoteMatrix principled voting system is made up of the 4 following interconnected modules. The Principle Matrix module allows you to define what you believe in and allows VoteMatrix to generate personalized approval ratings based on your principles. This module will include a survey system asking you questions that require enough feedback to ensure that your worldview is accurately represented. Each question will have a feedback feature so you can flag a question as biased and provide feedback on how better to word the question. This ensures that the questions on the site will be as equitable as possible. (Bias Block feature) By simply filling out the Principle Matrix, your world-view will be included in anonymous polling data provided to the public, this means that your voice will be heard by the media and by your representatives every election without you having to do anything more. The Trust Matrix module allows you to define which analysts you trust to do the research in each main Principle area. You could trust your friend, a family member, your union rep, your religious leader, a pundit, an organization, a news agency, or any other group to research issues regarding specific areas of concern they are qualified to research. If you prefer to do you own research, you can easily become your own analyst and access tools to help you fully research the issues on your ballot. Any analyst using the Trust Matrix will be able to map candidate actions and legislation to universal principles. If you share your findings, anyone who trusts you will get the benefit of your research. Analysts trusted by many users will qualify for compensation for their work or donations to their organization. Analysts will never directly suggest candidates or bills to individuals, so their research will be just as useful to someone who disagrees with their principles and in addition each analyst's ratings will include a feedback system to alert other users of analysts who do not accurately report their results making your recommendations unbiased and vetted. 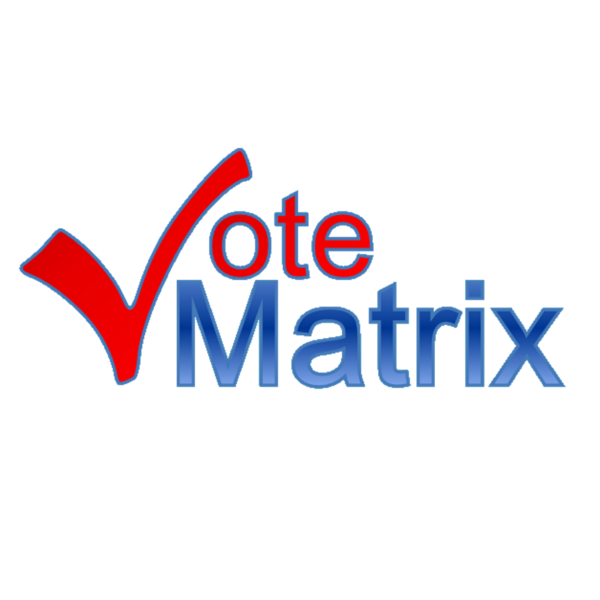 Prior to election day the VoteMatrix Ballot module provides you with your sample ballot and includes personalized recommendations and research using your Principle Matrix and Trust Matrix profile. This module acts as a political matchmaking system, so that you will know exactly what candidates and measures match your principles prior to election day. You can fill out your ballot ahead of time and this information will be used to populate real-time polling information that the public can see. This means that you won't need to be chosen in a random poll in order to register your support for the best candidate for the job of representing you. The VoteMatrix Ballot module will also allow you to procrastinate as long as you want. As long as your Principle Matrix and Trust Matrix were filled out in a prior election, then you will have all the information you need to vote, even at the last minute. After election day, the VoteMatrix Gov module allows you to keep track of your elected officials. Every bill authored, supported, or voted on will be tracked in the system and alerts will notify you whenever your representatives do anything that goes against your principles. This module will also allow representatives to see (anonymously) exactly how you and their other constituents want them to vote on each bill, ensuring your voice is heard. Democracy is about making government work for you, but in this democracy, you are obligated to devote days of research before every election to ensure you know who and what to vote for. You are given biased information from each side and are expected to listen to the media, search the internet, verify television ads, watch inconsequential debates, and then come to a rational and well-reasoned decision that matches your principles. The majority of voters don't have the time or the will to do this.